A small plate of cottage cheese. 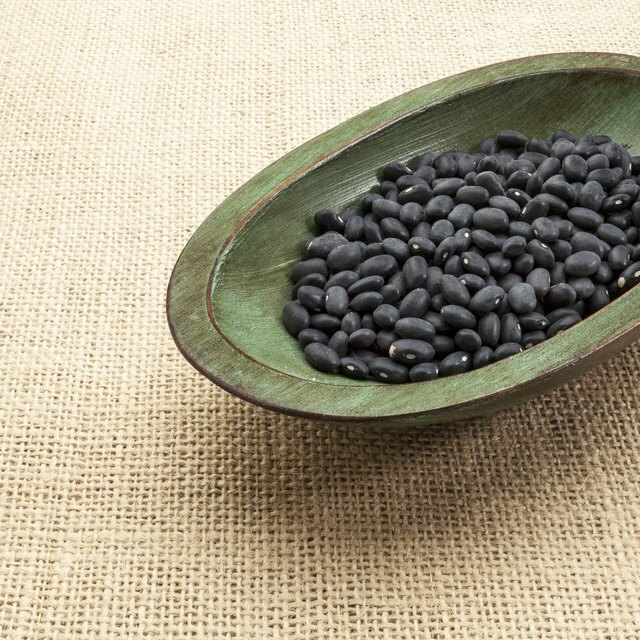 1 Are Black Beans & Lima Beans Good for Your Diet? 2 Is Soy Milk Casein-Free? When you can’t decide whether you’re in the mood for yogurt or cottage cheese, you may want to break the tie by choosing the one with the most nutrients. In that case, the clear winner is plain yogurt. They’re both good sources of calcium and vitamin B-12, but cottage cheese falls behind when it comes to other vitamins and minerals. Plain low-fat yogurt has 154 calories in a 1-cup serving, compared to 194 calories in low-fat cottage cheese, according to the U.S. Department of Agriculture's National Nutrient Database. Low-fat cottage cheese is higher in protein: One cup has 27 grams of protein, which is double the amount in plain low-fat yogurt. However, 1 cup of plain low-fat yogurt still supplies about one-fourth of your recommended daily protein, and Greek yogurt has about the same amount of protein as cottage cheese. Plain low-fat yogurt contains 17 grams of carbohydrates in a 1-cup serving compared to only 8 grams in low-fat cottage cheese. You won’t get fiber from either product. Cottage cheese contains more total fat than plain yogurt. One cup of plain low-fat yogurt has 4 grams of fat, compared to 5.5 grams in low-fat cottage cheese. The total fat in cottage cheese or plain yogurt increases by about 4 grams when either is made from whole milk. Both fat-free yogurt and fat-free cottage cheese have barely a trace of fat. It’s healthiest to avoid whole milk products because they’re much higher in saturated fat, which may contribute to coronary artery disease. Plain yogurt and cottage cheese are both excellent sources of vitamin B-12. Otherwise, plain yogurt delivers about two times more calcium, magnesium, zinc and vitamin B-6. It also has three times more potassium. Cottage cheese is still a rich source of calcium, but it has less than 10 percent of your recommended dietary allowance for the other nutrients. When they’re made from whole milk, they both supply vitamin A, but it’s depleted as fat is removed, so fat-free and low-fat brands won't contain vitamin A unless they're fortified. You also won't get any vitamin D from yogurt or cottage cheese if you don't buy fortified brands. Check the yogurt and cottage cheese you buy for sodium. You’ll get 172 milligrams from 1 cup of plain low-fat yogurt. The same portion of low-fat cottage cheese has 746 milligrams, or nearly half of the 1,500 daily intake recommended by the Institute of Medicine. Even without sweet flavorings, plain yogurt has double the amount of sugar -- in the form of lactose -- typically found in cottage cheese. Probiotics aren’t nutrients, but they’re another difference between the two. Cottage cheese may contain some probiotics, but it’s not known for providing the live and active bacterial cultures that you’ll get from most brands of yogurt. These live bacteria boost the healthy bacteria in your large intestine and support your immune system.